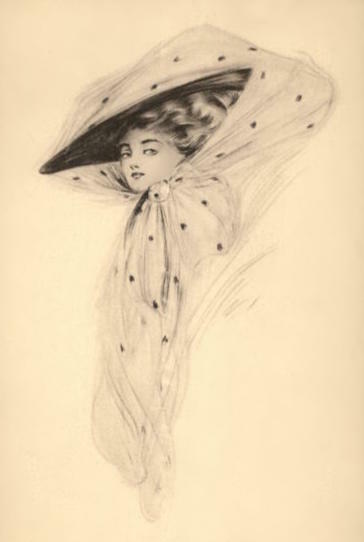 During the late 1800s and early 1900s no true lady ever left home without being properly attired. Isabella Alden would have abided by that rule. 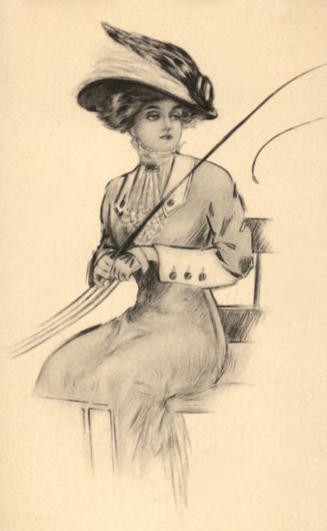 When paying calls or shopping, Isabella, like all women at the time, wore gloves as well as long sleeves and high collars to cover her arms and neck. 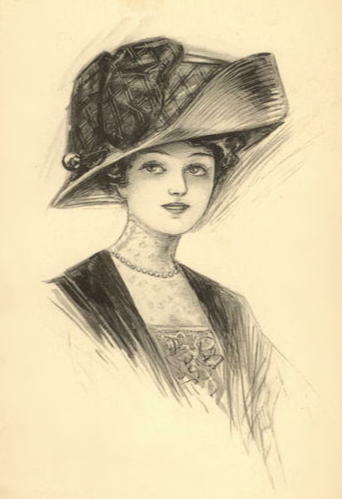 Even more importantly, ladies always wore bonnets. 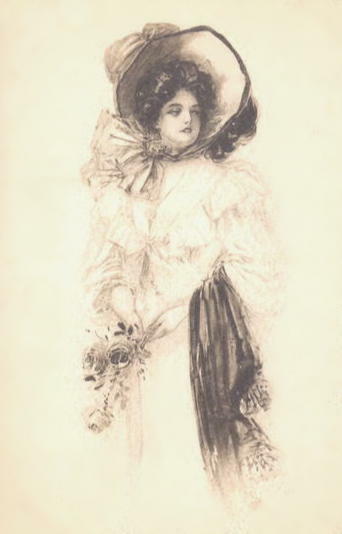 The fashion in 1895: A black straw hat trimmed with artificial roses, lily of the valley, and violets. Courtesy of HistoricNewEngland.org. 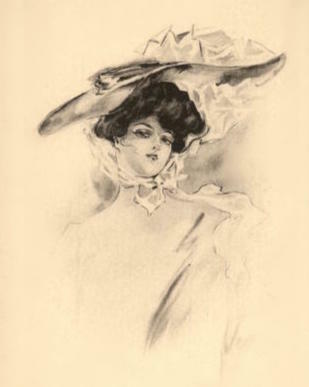 Bonnets were de rigeur for any lady in the out of doors; and while styles of bonnets changed from year to year, one constant was decoration; with few exceptions, ladies’ hats were decorated with ribbons, netting, swashes of fabric and—most commonly—with artificial flowers. 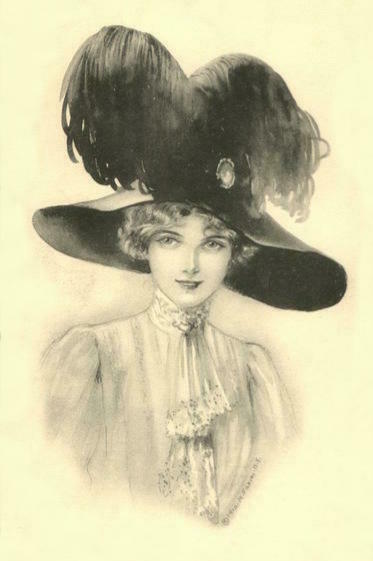 Hat styles in 1914, depicted in The Ladies Home Journal. 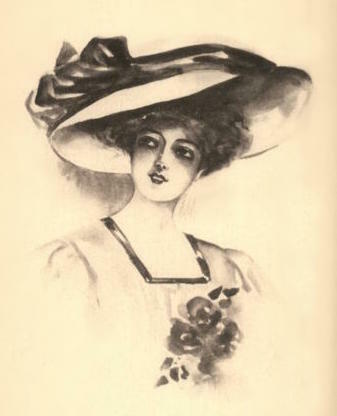 Woman of the era loved artificial flowers. 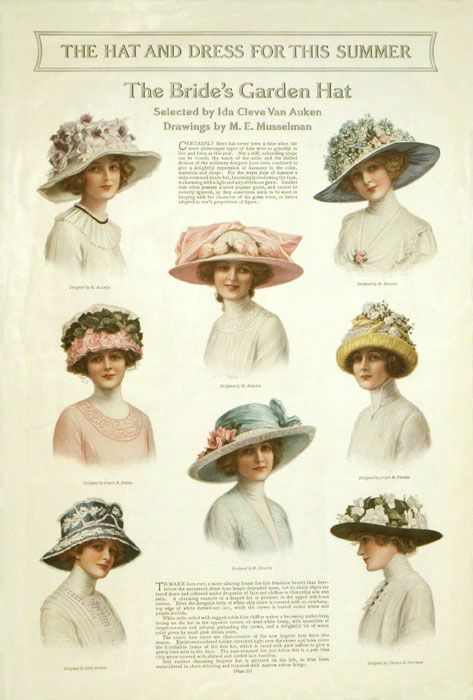 From small dainty buds to cabbage-sized blooms, women wore them not just on their bonnets, but in their hair and on their gowns, as well. Artificial flowers were in heavy demand; companies that supplied them were constantly adjusting their prices to gain an upper hand over their competition. 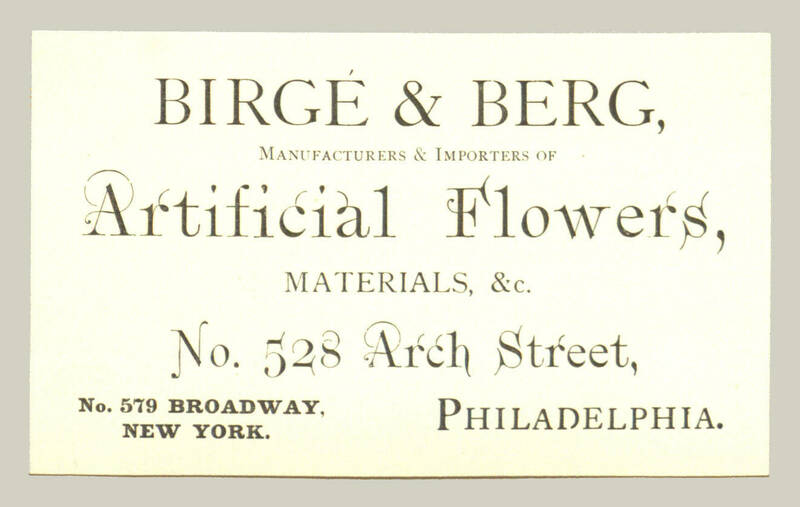 Business card for a dealer in artificial flowers. 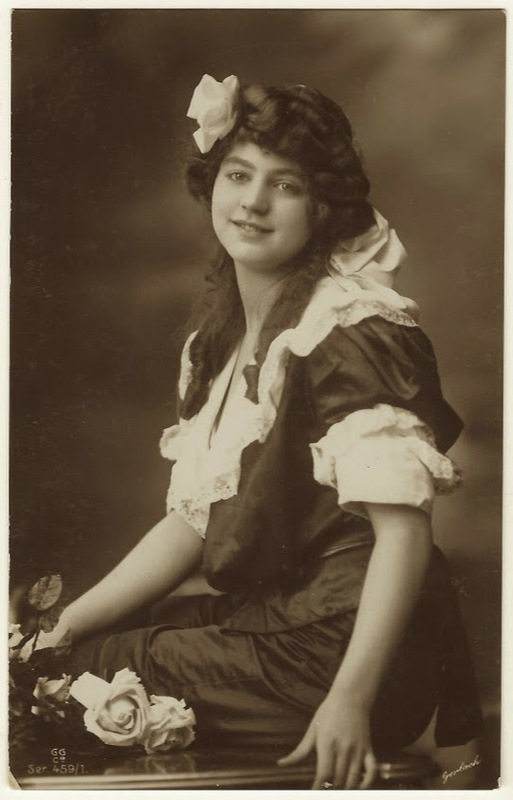 In Isabella’s lifetime, the American manufacturing industry was in its infancy; there were no machines that could make artificial flowers. So the flowers were constructed by human fingers, petal by individual petal. It was tedious, painstaking work that was typically performed by women and children for paltry wages. Flower Makers by Samuel Melton Fisher, 1896. 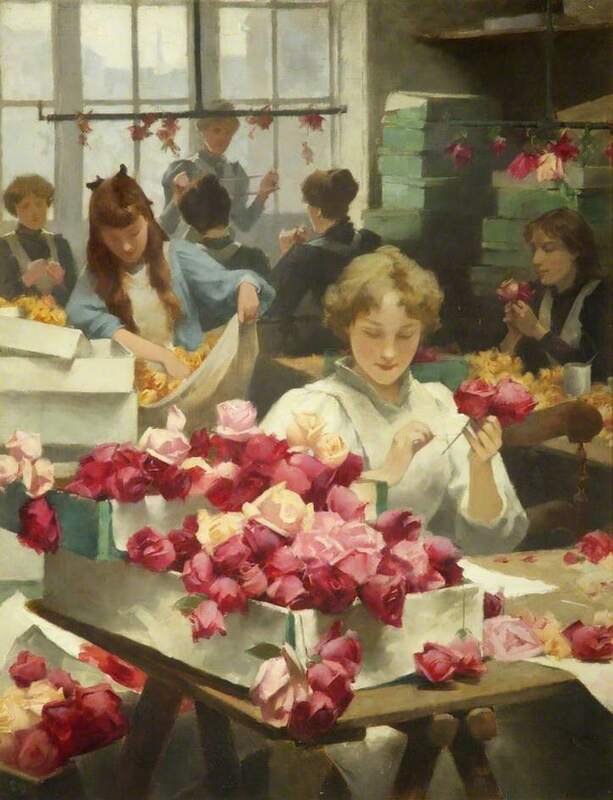 But Mr. Fisher’s painting shows an idealized setting, with women and girls in crisp white aprons happily gluing the petals of flowers together or attaching blooms to stems. 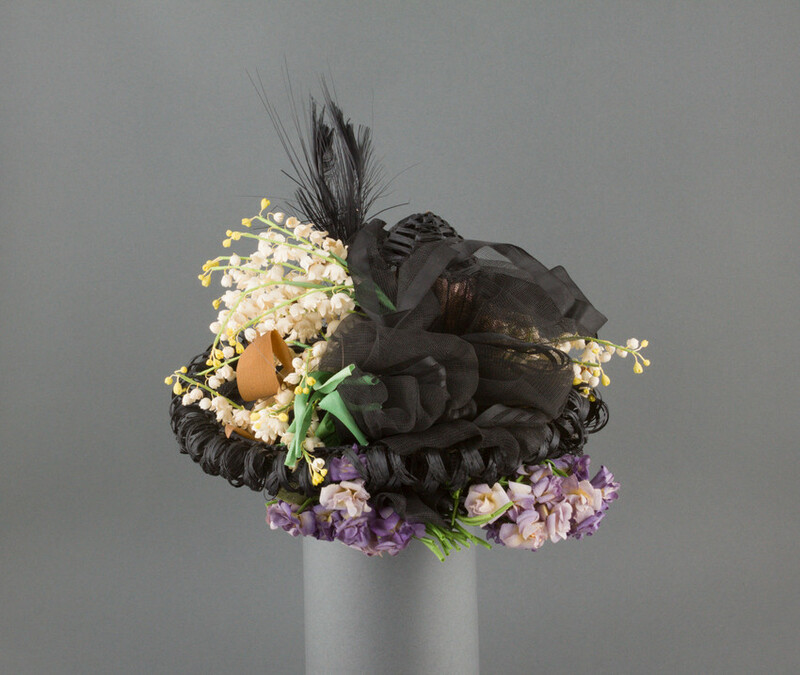 The truth was that the majority of artificial flowers were made as piecework in women’s homes. 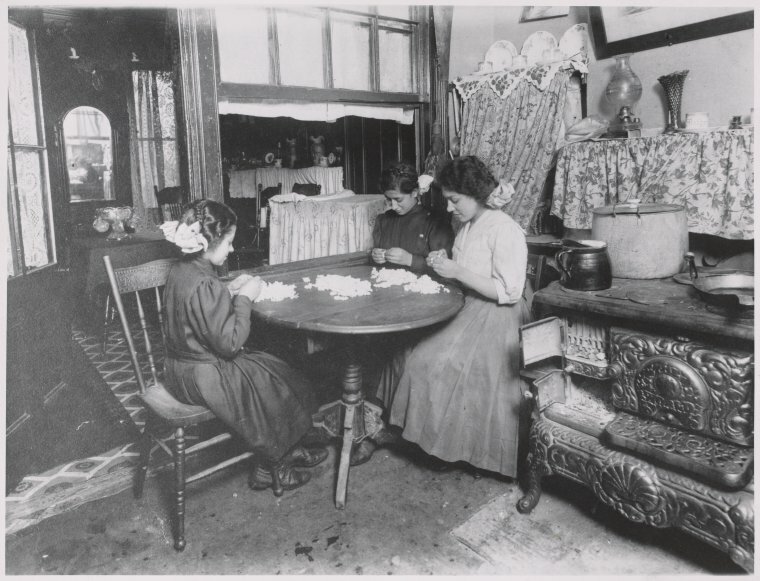 A mother and her children making artificial flowers in their home (1910). 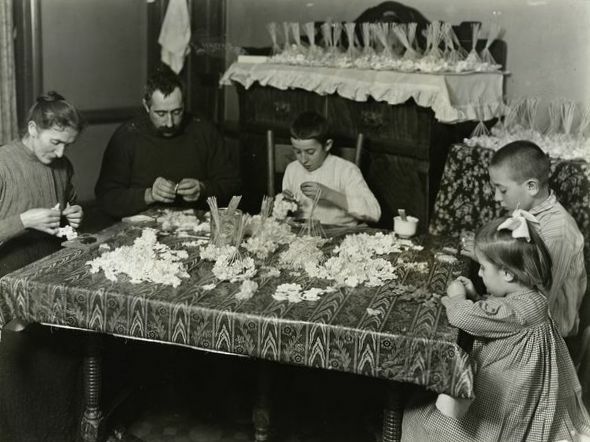 Frank, 14, John, 11, and Lizzie, 4, work with their parents at home making artificial flowers. The father helps because his health is too poor to do other work. The boys work from Saturday afternoon and evening until 10 or 11 p.m. Lizzie separates petals. They make regularly from ten to twelve gross a week for which they are paid 6 cents a gross. At 6 cents a gross, Frank’s family earned between 60 and 72 cents a week. To put that amount into perspective, a loaf of bread at the time cost 5 cents; a quarter of milk cost 6 cents, and a dozen eggs cost 22 cents. Given the amount Frank and his family earned, they were able to afford just enough food to survive. Young women making artificial flowers. 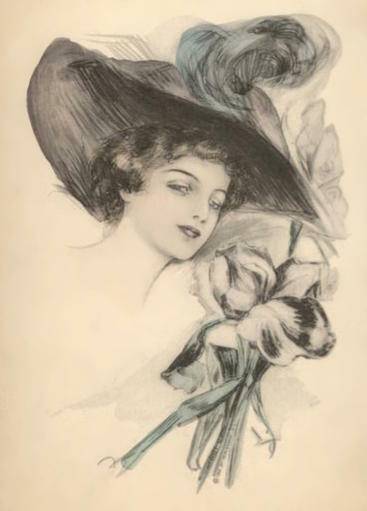 The demand for artificial flowers remained high for decades. Some unscrupulous suppliers rounded up street children and locked them in rooms, forcing them to make flowers for 12 to 14 hours a day. The children were give little food and allowed minimal rest before they were made to begin work again. 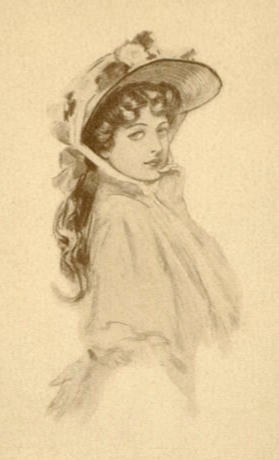 Eleanor H. Porter, the popular author of the Pollyanna series of classic children’s novels, wrote about the plight of such children in her book, Cross Currents. 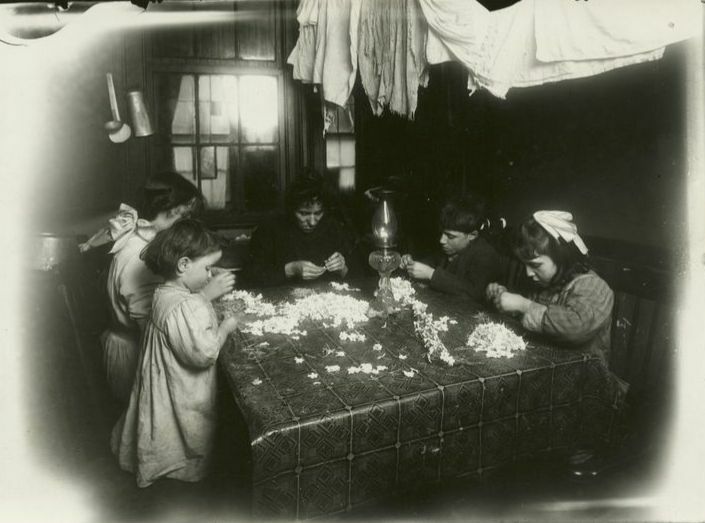 Although many of the children in Isabella’s novels had jobs or worked to help support their families, none of them assembled flowers; still, it was such a wide-spread cottage industry, Isabella was probably very aware of the practice. 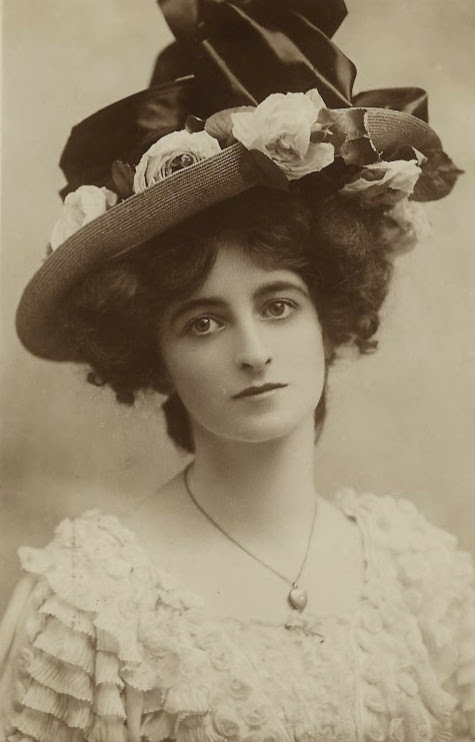 There’s no available photograph of Isabella to tell us whether she liked artificial flowers on her bonnets; but in her memoirs, Isabella mentioned that when she was a young bride, she wore a hat that a woman at church felt was “too gay” for a minister’s wife to wear. 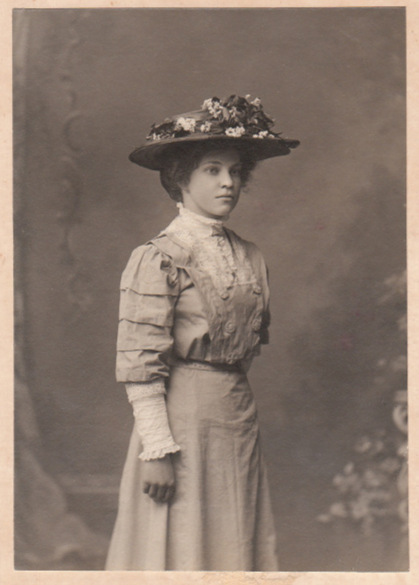 The woman went so far as to send Isabella an incredibly ugly hat for her to wear instead. 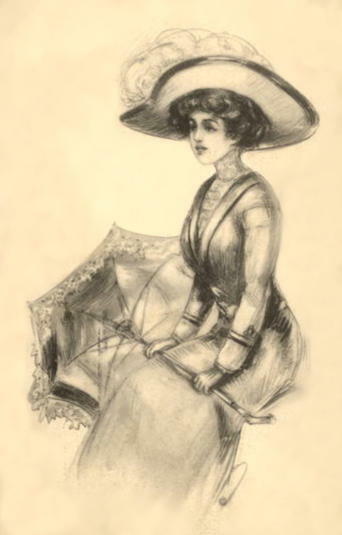 Isabella even wrote about the incident in her novel Aunt Hannah and Martha and John. 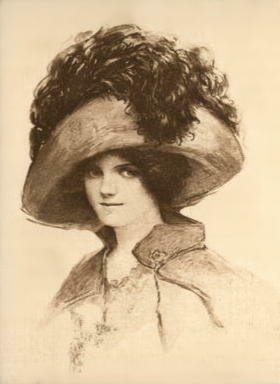 In the story (just as it happened in Isabella’s real life) an anonymous person sends newly-wed Martha Remington a very unattractive hat. Martha’s struggles in deciding whether to wear the horrid creation to church reflected the very same struggles Isabella endured in the very same situation! You can read more about the books mentioned in this post by clicking on the book covers. 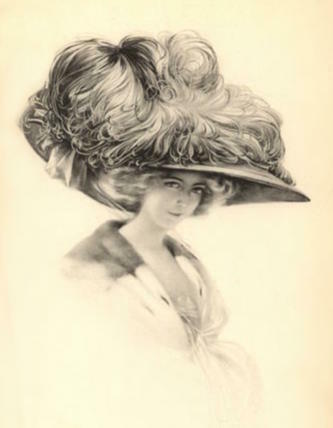 January 17 is National Wear A Hat Day. 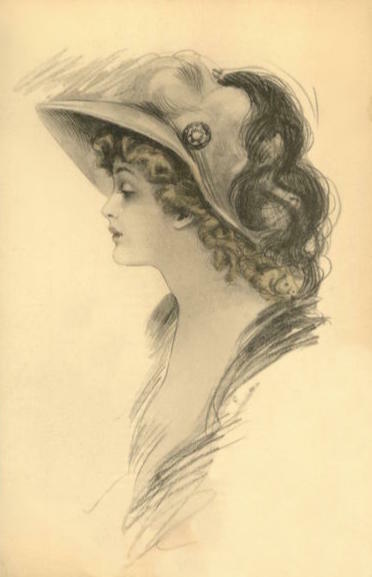 In honor of the occasion, here are sketches of lovely ladies wearing hats that were popular at the turn of the 20th Century. 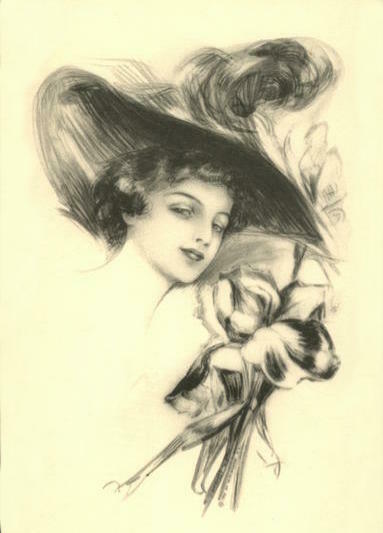 Now yellowed with age, these black and white drawings were often used in advertisements and on trade cards. 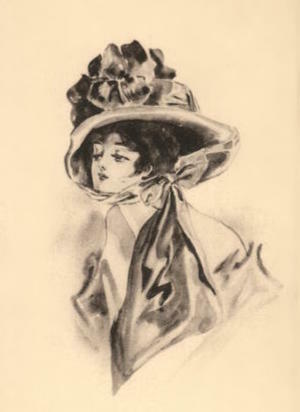 Isabella Alden’s first book was published in 1865 and she continued to publish fiction through the 1920s. Her stories spanned many decades and she saw fashion styles come and go throughout her long life. 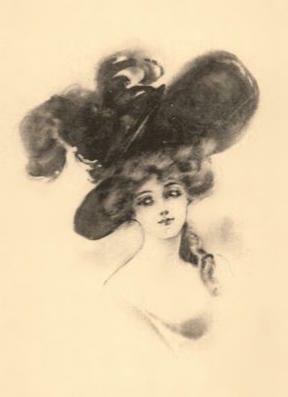 These stylish hats might have been worn by Isabella’s heroines in her books, Making Fate, Overruled, As In A Mirror, Four Mothers at Chautauqua and Ruth Erskine’s Son, which were all published between 1895 and 1905.